You can add two 1" wide black leather straps and nickle-plated buckles to the opening end of your Sport Kilt. A functional, traditional looking adjustable double strap. 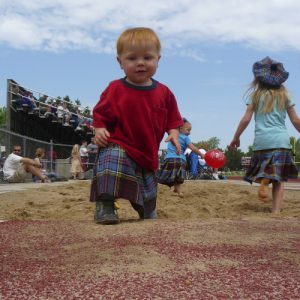 Youth Kilt – to fit ages 5 to 7 years old (usually). For waist sizes 25-30 inches. Length is 14 inches. Machine washable, poly blend material soft enough for sensitive skin; adjustable elastic waistband with a velcro closure for adjustability and room for growth. Made in the USA!